RegenOx® has been successfully used as an emergency response cleanup reagent by the Swedish Army to remediate a minor fuel spill caused by a pinched hydraulic hose, in the Swedish mission region of Afghanistan. Sweden established a number of bases in Afghanistan on which fuels and oil spills may occur, most commonly from fuel leaks or ruptured hydraulic hoses. 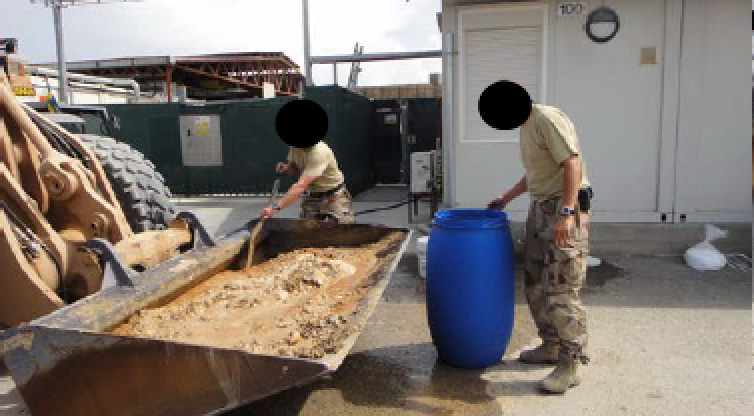 Fuel leakage during filling of the camp depot tanks, refueling its own vehicles, leakage from small generators and heating units and ruptured hydraulic hoses are the most common causes of pollution at military bases. The Swedish Armed Forces aim to return land in the same condition as before military use, so that it poses no risk to the environment or the population using the land in the future. In this case, a small amount of hydraulic oil was spilled when a cable was crimped during use. The impacted soils were excavated and stored, leaving a small excavation. Despite the small amount of oil that had leaked (between 10 and 20 L) and rapid intervention by the army, the oil was excavated a few hours after the leak, leaving a treatment area of 3 x 3 meters. Regenesis and a swedish remediation contractor then provided a remedial design using RegenOx to chemically oxidise the contamination. Using an excavator bucket the RegenOx was mixed in with the contaminated soil to allow for good distribution and contact with the soil. The treated soil was then covered by a tarpaulin to avoid it drying out too quickly in the heat. RegenOx was also applied as a slurry in the exacavation pit. Both the soils and pit were sprayed with water over subsequent days to allow the RegenOx to remain active in the soils. The military report which documents the spill and subsequent cleanup actions, states that RegenOX is a good solution for treating fuel spills on military bases that have leaked into the subsurface. RegenOx is safe to use and highly effective; treating contamination without the production of excess heat or vapour. This allows treatment of oil spills in difficult and sensitive locations.